The Philips SHB5250BK FreshTones is a pair of Bluetooth 4.1 in-ear headphones with 14.2 mm speaker drivers for solid bass. Weighing approximately 14 grams and sporting a geometric comfort fit design, the pair comes with a flat, tangle-free cable and offers up to 4.5 hours of music playtime and 55 hours of standby time. The call management features include the ability to answer/end calls, and switch between music and calls. Designed for wireless freedom on the go, these Philips MyJam FreshTones BT earphones feature 14.2mm drivers for big bass and optimal fit designed around ear geometry. A design based on ear geometry creates a comfortable, snug fit for everyone. Quality 14.2mm speaker drivers with a bass vent design on the earphones for rich bass. Pair your smart device with your headphones using Bluetooth and enjoy the freedom of crystal clear music and phone calls - without the hassle of cables. Enjoy the freedom of listening to music and phone calls - without the hassle of a cable. Change tracks, volume control, and answer calls with an easy to use remote control. 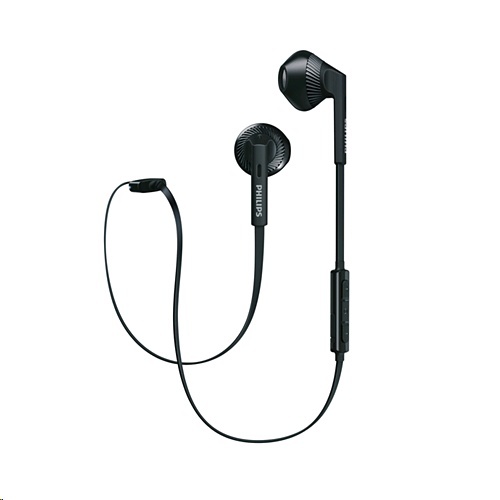 Using a rubberized Flex-grip cable relief between the headphones and the cable, the connection is protected from damage through repeated bending extending its life. Flat cable ensures that your cord stays smooth and tangle free - always.